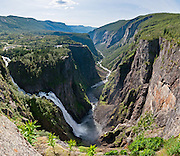 View our photo collection of southern Norway and western fjordland, Europe. Hike to Pulpit Rock (Preikestolen or Prekestolen) high above Lysefjord. View Sognefjord (with branches Aurlandsfjord, Nærøyfjord, Lustrafjord, Lærdalsfjord), Geirangerfjord branch of Storfjord, and Innvikfjorden arm of Nordfjord. See Nærøy Valley (Nærøydalen) and Jordalsnuten mountain from Stalheim Hotel. See Vøringsfossen waterfall. 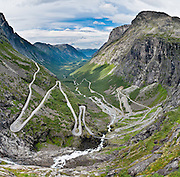 Drive Trollstigen (the Troll's Ladder) to the Troll Wall (Trollveggen) and Trolltindane (Troll Peaks) in Roms Valley. Explore deeply glaciated valleys beneath Jostedalsbreen glacier, the largest ice sheet in continental Europe, starting at Olden, Loen, and Lovatnet lake. 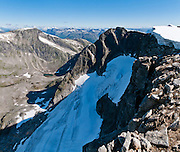 In Jostedalsbreen National Park, ascend 6047 feet (1841 meters) to Skålatårnet (or Kloumanntårnet) on Skåla, the highest tidewater mountain in Norway.